a nineteen month old toddler is quite the adventure! colored pencils and crayons and I let Lucy pick whatever she wants to work with. Then we both get to work creating. but after about 15 minutes things start to get very interesting! drawing with her on my back and then it's time to call it quits. this weekend we created Mothers Day cards with it. 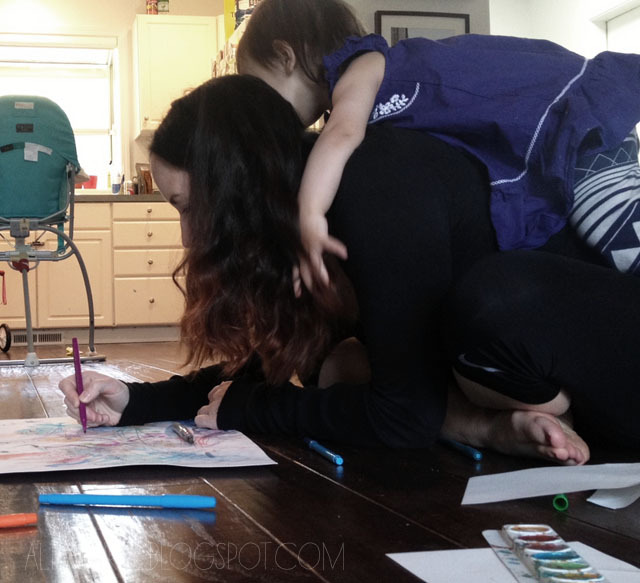 fun that an artsy mama could wish for! Beautiful art you made together! They painted, printed, stamped, play doughed and created many dinosaur worlds on that crusty old rug. Best part was we didn't clean it afterwards although there were some colourful rainbow baths with four of them! My favourites were when they painted each others bodies for hours on end. All very Lord of the Flies! How cute this is, love seeing you two paint together. The cards came out beautiful!! My daughter surprised me with one of your iphone cases yesterday! It's so pretty! Totally made my day getting this! Thanks for sharing your art with us!! It's a special time together and the pieces you create will be treasured reminders. What wonderful memories and treasured keepsakes you are making for little Lucy!! My mom was the best at encouraging creativity and often had "art" time for us growing up. The time you are spending will pay dividends in the future! Lucky Lucy! Good job, a joy to see, your easy going way. Great ideas! What a fun way to spend time together?!?!?! 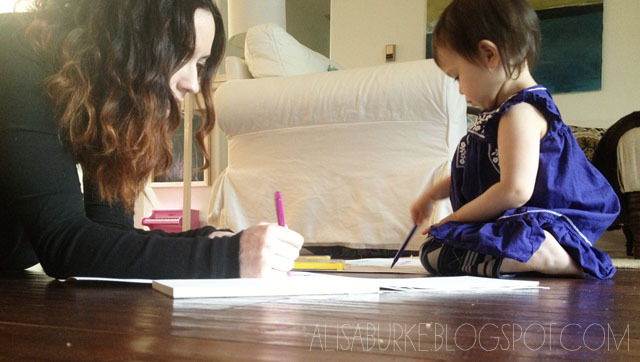 Alisa...you continue to amaze me with your creativity and your incredible outlook to being such a wonderful mom! Lucy is so lucky to have you! Ah Bellissimo! You are a beautiful mamma, Happy belated Mother's Day to you! You really are an incredible mother, artist and I am sure wife as well. 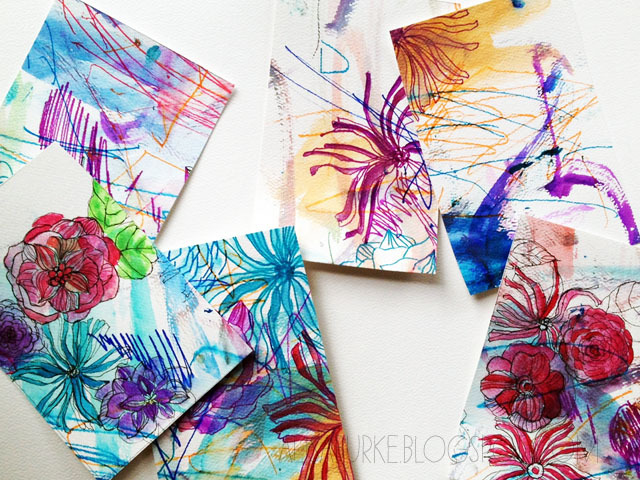 I love this artwork and think these designs would make amazing fabrics. The cards are absolutely spectacular! So much beauty created by mom and daughter. Thanks for sharing. 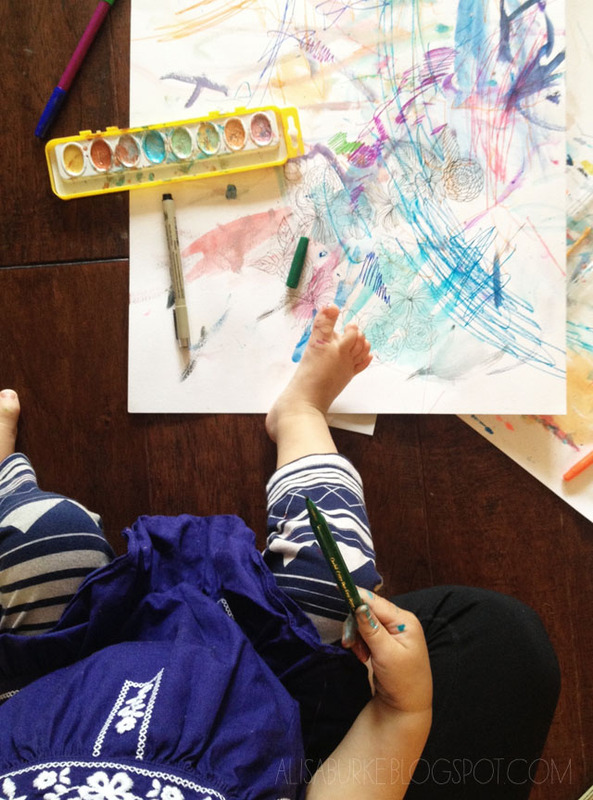 Yay for artsy mamas!! :D xoxo love!!! You rock! It is wonderful that you let her explore and are willing to let the messes be big even though the time spent creating is so short. I did this too and my friends were shocked. They would never bring out supplies as they didn't want to clean it all up. But the fun they missed! 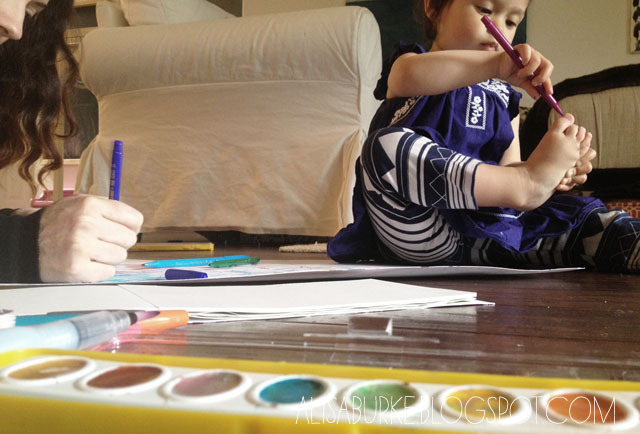 Love this post and the photos of you and Lucy making art. My grand loves to "make art", we've been doing it since she was 1 and she loves coming to my house. First thing she says when she sees me is "mimi, let's make art!". IT is the best fun! LOVE. Trying to do this with my 23 month old. Her outfit is soo cute -- purple is a great color, my 23 month old has the same coloring. Your post is so beautiful! There is nothing more fun than creating and playing with "stuff" with your young children. 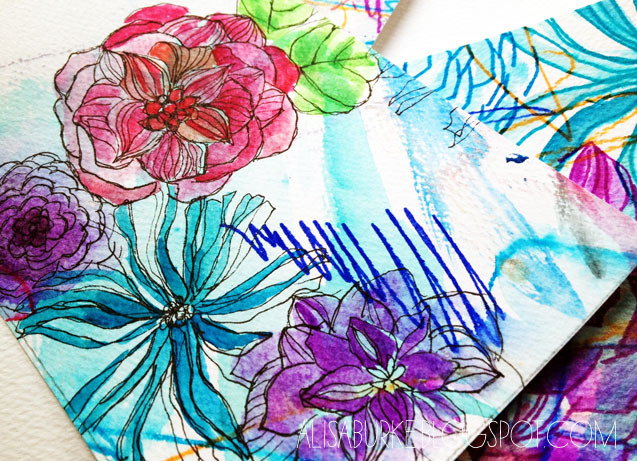 I kept a collection of all sorts of fun things to use for collaging, painting, coloring, etc. My 3 girls made lots of messes and had a blast doing it (so did I). And they were free to do it their way, which made for some pretty interesting artwork! By the time my oldest daughter was about 3 to 3 1/2. teachers at her pre-school wanted me to enroll her in private art lessons because they saw she was gifted. I declined, wishing for my child to create freely, without restrictions. She has been artistic all her life as a result. Highlight of her high school career was attending the Governor's School for the Arts (design was her area of interest). She then studied design for architecture in college. You never know what all that fun with creativity will lead to, so keep it up! Thanks for sharing the great photos. These photos are totally PRICELESS! Especially the one of Lucy painting her toe with the marker!! Love it. I LOVE this post. Precious! My son and I made Christmas post cards in a similar fashion one year when he was not much older than your daughter. He is 26 now! So sweet. 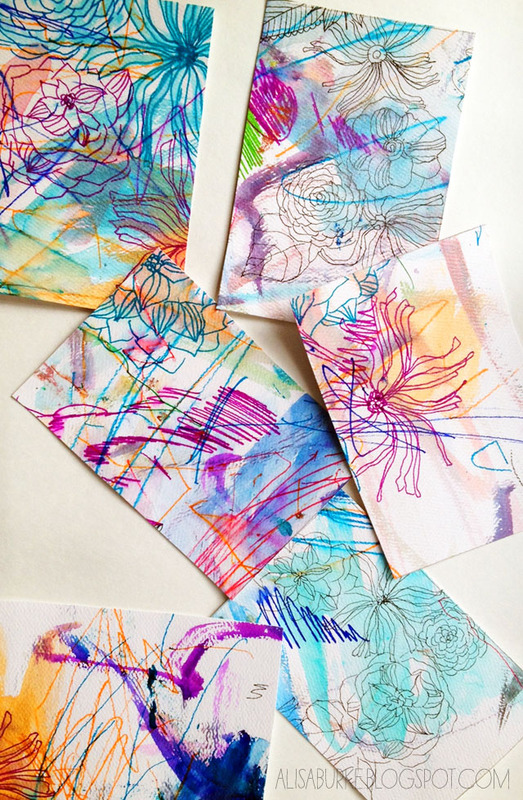 I recently used my 14 month old's finger paintings in a project and it was so much fun. If I could draw worth a crap I would totally do this. Thanks for sharing. That is such a fun idea. You both look like you really enjoyed the process. 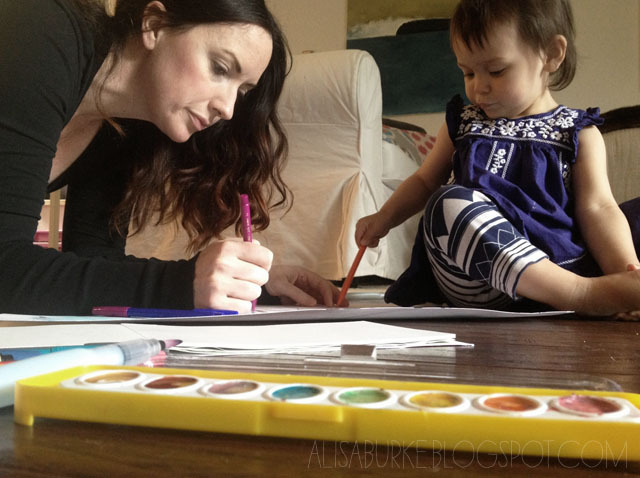 I imagine this activity will increase her appreciation of art, knowing that her Mama loves it too.